Stamps > My Favorite Things Clear Stamps: "Festive Flamingos"
My Favorite Things Clear Stamps: "Festive Flamingos"
The Festive Flamingos stamp set includes four flamboyant flamingos who may seem out of their typically-tropical element but surprisingly, are completely at home in their holiday apparel and accessories. Each bird features a unique take on seasonal attire antlers, scarves, lights, and ice skates are all in the mix. Their casual poses and opposing directions make it easy to create scenes showcasing flamingos interacting in a variety of ways...we certainly hope to see a couple of skating flamingos gracefully gliding towards one another. 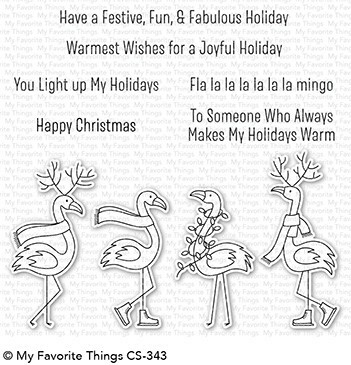 Six sentiments are included to customize your card fronts and interiors (we're certain Fla la la la la la la mingo will become the next holiday classic chorus!) Clear stamp sets include the name of the set on the sticker for easy identification. Our clear stamps and Die-namics are made in the USA.